Eric Phillips and Mary Dennis discuss the use of triple quadrupole GC-MS/MS as a potential solution for accurate detection, measurement and analysis of VNAs in tobacco. Volatile nitrosamines (VNAs) are a class of compounds that comprise one of the most important groups of carcinogens found in tobacco-related products. These chemicals pose significant health risks to humans and, as such, it is fundamental to measure the amount of VNAs present in tobacco. Although gas chromatography (GC) and thermal energy analyser (TEA) detection have traditionally been successful in the measurement of VNAs, these methods, used both separately and in conjunction with one another, face significant challenges in light of tightened regulations. VNAs are formed during the processing of tobacco, as well as during the smoking of tobacco products by reaction of nitrogen oxide (NOX) with amines. These harmful compounds are present in both smokeless tobacco products and in cigarette smoke. In 2008, the World Health Organization (WHO) published a technical report entitled 'The Scientific Basis of Tobacco Product Regulation'. Based on this report, a WHO study group recommended the mandated lowering of toxicants in cigarette smoke, including tobacco-specific nitrosamines and other selected constituents. The report recommends a strategy for regulation based on product performance measures, with the goal of reducing toxicant levels in mainstream cigarette smoke. It recommends establishing levels for selected mainstream smoke toxicants per milligram of nicotine and prohibiting the sale or import of cigarette brands that have yields above these levels. The initial regulatory levels recommended for nitrosamines are 0.072µg/mg for 4-(N-nitrosomethylamino)-1-(3-pyridyl)-1-butanone (NNK) and 0.114µg/mg for N-nitrosonornicotine (NNN). Detection, measurement and analysis of VNAs have traditionally been accomplished using gas chromatography (GC) and thermal energy analyser (TEA) detection. 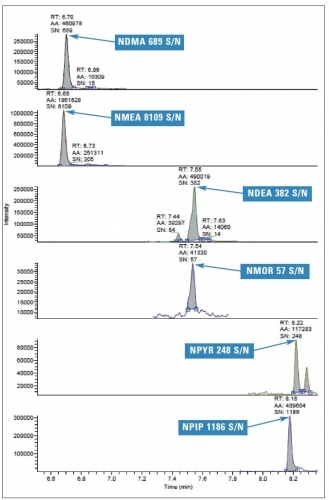 This combined technique allows the detection of VNAs, but poses two key challenges. The first challenge is that it is not capable of achieving the low detection limits required by current legislation. In addition, once the identification of VNAs has been completed, GC-TEA does not allow further analysis of the tobacco samples for other contaminants. The use of GC is preferable due to the significant amount of chromatography information that becomes available when using this technique. Recent technological advancements have demonstrated that by coupling a gas chromatograph to a triple quadrupole mass spectrometer, the effective separation of VNAs can be achieved, while decreasing detection limits, increasing specificity and allowing for the analysis of many other organic contaminants including pesticides. The technique can be used in conjunction with timed selected reaction monitoring (t-SRM), thereby allowing the operator of the system to easily set up methods and run samples while the instrument automatically determines the optimal time for SRM parameters, even with partial overlap of SRM transitions. This innovative technology delivers significantly lower detection limits and limits of quantitation than conventional GC-TEA. A simple three-step sample preparation procedure was followed. A 2g sample was initially placed in 0.01 N KOH solution, which was then shaken for 30 minutes followed by centrifugation. A 10mL aliquot of the sample was subsequently extracted using solid phase extraction, going from an aqueous sample to methylene chloride. The final extract was then concentrated to 1mL. An autosampler (TriPlus, Thermo Fisher Scientific) was used to provide the 1µL injection. The system's syringe was held in the injector for four seconds before and three seconds after the plunger was depressed. GC analysis was performed on a gas chromatograph (TRACE GC Ultra, Thermo Fisher Scientific) which used a two-step oven ramp. The oven program started at 45°C for three minutes, with a first ramp at 25°C/min to 130°C and a second ramp at 12°C/min to 250°C, with a final hold of two minutes. A medium polarity column was used to provide better separations of the nitrosamines. The splitless injector temperature was set at 140°C and the surge pressure was set at 300kPa for two minutes. The column flow rate was held constant at 1.5mL/min. A triple quadrupole mass spectrometer (TSQ Quantum XLS, Thermo Fisher Scientific) was optimised for positive chemical ionization (PCI) using methane as the reagent gas. The optimum methane flow rate was 2.5mL/min and the source temperature was set at 210°C. t-SRM provided increased precision and sensitivity by only performing SRM transitions near peak elution. This reduced the amount of transition overlap, which in turn increased dwell time and thus sensitivity and precision. 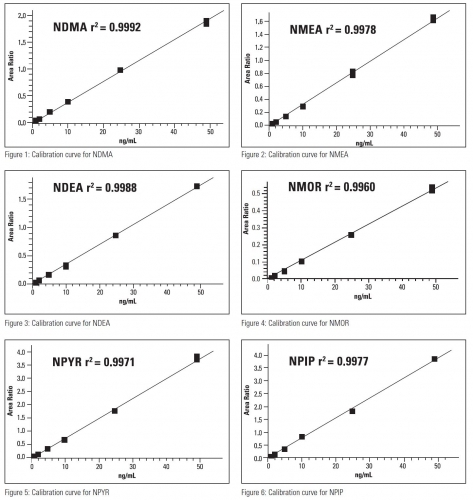 The matrix calibration curves ranged from 2-50ng/mL and 1-25µg/kg were extracted from matrix (Figs1-6). All components exhibited a correlation coefficient of better than 0.995 r2 value. The percent variance for the points of the matrix calibration curves was less than 25 per cent. Initially, a minimum detection limit was found to be 1ng/mL, with a1 µL injection volume. A known uncontaminated sample was spiked and run at that level. The results indicate that a detection limit lower than 1ng/mL, or 0.5µg/kg in sample, could be achieved (Fig. 7). In order to protect public health and adhere to the strict legislative requirements, the tobacco industry needs a competent method that can facilitate accurate and reliable detection, measurement and analysis of low levels of VNAs in tobacco. Conventional GC-TEA technology has been used for many years for the measurement of VNAs, however this method is specific only to VNAs and does not achieve the low detection limits required by regulations. Triple quadrupole GC-MS/MS, used together with t-SRM, offers an alternative powerful solution for dependable, low-level analysis of VNAs and other contaminants in tobacco. The technique is highly sensitive and generates calibration curves that exhibit good linearity. Eric Phillips, Thermo Fisher Scientific, Austin, TX, USA. www.thermofisher.com. Mary Dennis, Lancaster Laboratories, Inc., Lancaster, PA, USA. http://lancasterlabs.com. Reference: 1. WHO Technical Report Series, The Scientific Basis of Tobacco Product Regulation, Second Report of a WHO Study Group, www.who.int/tobacco/global_interaction/tobreg/publications/9789241209519.pdf.